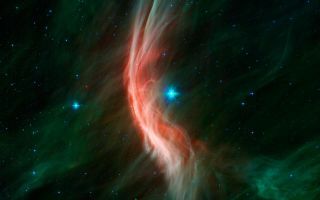 The giant star Zeta Ophiuchi is having a "shocking" effect on the surrounding dust clouds in this infrared image from NASA's Spitzer Space Telescope. The giant star Zeta Ophiuchi is having a "shocking" effect on the surrounding dust clouds in this infrared image from NASA's Spitzer Space Telescope as seen in this cool space wallpaper. Stellar winds flowing out from this fast-moving star are making ripples in the dust as it approaches, creating a bow shock seen as glowing gossamer threads, which, for this star, are only seen in infrared light. Zeta Ophiuchi is a young, large and hot star located around 370 light-years away. It dwarfs our own sun in many ways -- it is about six times hotter, eight times wider, 20 times more massive, and about 80,000 times as bright. Even at its great distance, it would be one of the brightest stars in the sky were it not largely obscured by foreground dust clouds.